Graydaze is the only single source offering painting, specialty coatings, and sealant installation to the warehouse and manufacturing construction industry. Bundling what has historically been multiple trades into a qualified single source with one point of contact has proven to reduce the overall project cost and duration. Graydaze Contracting's reputation and successful business partnerships are a direct result of marketing to specific industries and building relationships with the people that share our common values of selling people, not projects. We are proud of our years of repeat business with so many market leaders in commercial real estate, manufacturing industry, and distribution/warehouse operators. Graydaze is also continually recognized as one of the best specialty contractors in the nation. 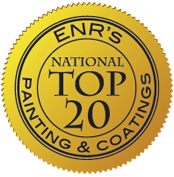 In 2017, Engineering News Record ranked Graydaze #17 on their "Top 20 Firms in Painting” list. We pride ourselves on our "roll up your sleeves" work ethic and always do what’s best for our customers. From Massachusetts to California, we never back down from a challenge and we ensure our team is fully trained and prepared for any job we take on. Watch these short videos to learn more about the Graydaze difference. 11495 North Fulton Industrial Blvd. © 2017 Graydaze Contracting, Inc.
© 2017 Graydaze Contracting, Inc. All rights reserved.